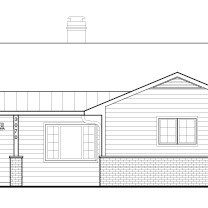 Our Clients purchased this mid-century ranch style home for the high quality of the neighborhood and community. The project involves renovations to the entire home and strategic additions to transform the home into one fitting our Client’s lifestyle. A small front addition provides; space to expand and redesign the kitchen and dining areas, integration a new mud room between the garage and kitchen, and a new front porch. 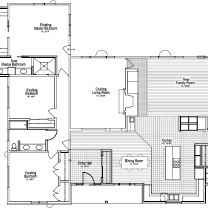 The wall between the kitchen and family room is partially removed to open up the spaces to each other. The family room is further modified with a new, higher, sloped ceiling. 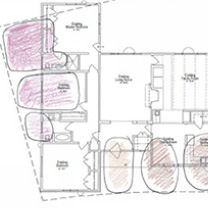 An addition on the north side creates space for an expanded master bath and walk-in closet, giving the home a true master suite. 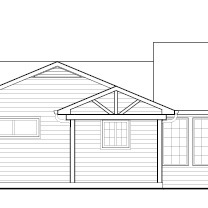 A covered porch addition and new patio at the rear of the home provides outdoor living space with views to the wooded ravine beyond, and an adjacent garage expansion houses the lawn mower, tools and a work shop.